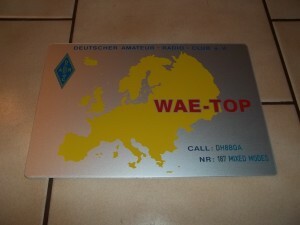 Friday I found my WAE-TOP plaque in the post box. 🙂 WAE stands for Worked All Europe, a challenging awards program by DARC. I had applied for the WAE award already a few years ago but to go for the plaque or even trophy entirely through DCL, DARC’s Contest Logbook, takes quite a while. So even the plaque was applied for using only electronic confirmations from DCL itself as well as LotW confirmations imported into DCL. I certainly could have applied for it much earlier using my paper cards but everything lies unsorted in my cupboard. To sort everything thru and make it a system is a job I can do when getting pension in some 30+ years. 😉 Many thanks to Wolfgang, DF8AA, who serves as the awards manager and did a nice job once again.